Accommodating some of the biggest superyachts ever made and attracting visitors travelling from some of the most exciting places in the world, Marigot Bay Marina is a spectacular sight to behold. A beautiful combination of deep blue waters from the bay and crisp, green palms from the gardens, Marigot Bay Marina is a showstopper. 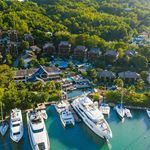 As practical as it is beautiful, the marina provides convenient access to the Caribbean for yacht charters and offers a 5 star luxury resort open all year for boaters and their guests.